Allegory as a literary device is a powerful tool in literacy development. Beginning in the early years teachers use allegory to explore moral lessons and critical issues. How often do we read books with animal characters who experience significant challenges and how well do children respond to the texts?… very well! Last week I (yiola) took my children to a birthday party at the movie theatre where they watched The Angry Birds. I had no idea what the movie was about although my 4 year son mentioned it had to do with birds protecting their eggs from pigs. Hmmmm, sounds… interesting. As I sat in the movie theatre I watched and chuckled at the community of birds and enjoyed the simple characters of each bird… and then I watched as ships sailed onto “Bird Island” and a King Pig with a small entourage befriended the birds, showering them with gifts and new ‘treasures’ that were unfamiliar to the birds. Slowly the pigs began to take over the island and they stole all the birds’ eggs. The birds then tried to rescue their eggs. Lines such as: “They stole our kids… who DOES that?” and later when the birds invaded “Piggie Island” to rescue the eggs the “King Pig” exclaimed, “what are you doing here? This is a civilized brunch” left me sinking in my seat and feeling uncomfortable. Without doubt The Angry Birds, to me, is an allegory of colonialism. After viewing the movie I began researching articles and critiques and while I found several interpretations very few note colonialism. To my surprise, many an in-depth discussions have occurred over The Angry Birds. From story line to historical facts to critical literacy to media literacy, I am pleased to see how an animated film could spark such interesting discussion. Now, imagine how using popular culture like the popular video game The Angry Birds and combining it with popular media like a Hollywood movie and applying analysis and interpretation of the use of allegory in a middle school or high school setting to discuss critical social issues like Aboriginal history or immigration. Narratives are such powerful tools for thinking about life. Allegory as a literary device has the potential to raise significant awareness and heighten a love for literacy. If we talk about literacy, we have to talk about how to enhance our children’s mastery over the tools needed to live intelligent, creative, and involved lives. 1.Danny Glover suffered dyslexia at school when he was younger and the school staff would label him retarded. This definitely was not very encouraging for him but he ended up finding ways to feel better about himself. He says that dyslexia had given him the feeling that he was not worthy to learn and that the people around him would not care of what would happen to his education. With time he eventually regained his self-esteem and became a great actor. 2. 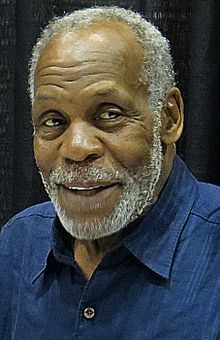 Danny Glover is a political and civil rights activist. For example, while attending San Francisco State University (SFSU), Glover was a member of the Black Students Union, which, along with the Third World Liberation Front and the American Federation of Teachers, collaborated in a five-month student-led strike to establish a Department of Black Studies. The strike was the longest student walkout in U.S. history. It helped create not only the first Department of Black Studies but also the first School of Ethnic Studies in the United States. I am sure these two factors contribute enormously to Mr. Glover’s insightful views on literacy. 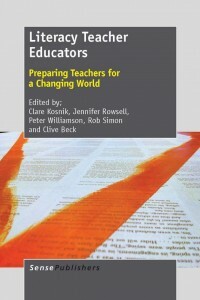 What we make of our backgrounds shape our identities as leaders, particularly in education. My newly discovered knowledge of Mr. Glover increases my respect for him not only as an actor, but as a human being. 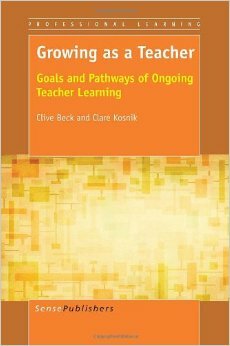 I look forward to reading more about his journey and commitment to literacy development. A few weeks ago, I (Pooja) was watching an episode of Dora the Explorer with my niece and nephew. Dora and her friends were on an adventure and as per usual got lost. I expected Dora to whip out her handy animated friend, Map (see below). For as long as I could remember, Map had been an integral character of the Dora the Explorer Show. Map helped the viewers understand the cardinal directions, locate familiar landmarks, and use a compass. So, I was surprised when I saw Dora reach into her pocket and pull out her phone and open Map App!!! After my initial surprise, I started to understand why the Map character had been replaced with an app. Viewers, like my 5-year-old niece and nephew had never held a map or seen a map, so of course they couldn’t relate to it. Now, an app? They know all about those! The initial character Map was introduced to teach life skills. Do you think the Map App will be able to teach the same skills or more? I (Clare) just found out that Thursday March 3 is World Book Day. What a wonderful event to celebrate. Check out this site from England: http://www.worldbookday.com which has lots of suggestions for activities for the day. 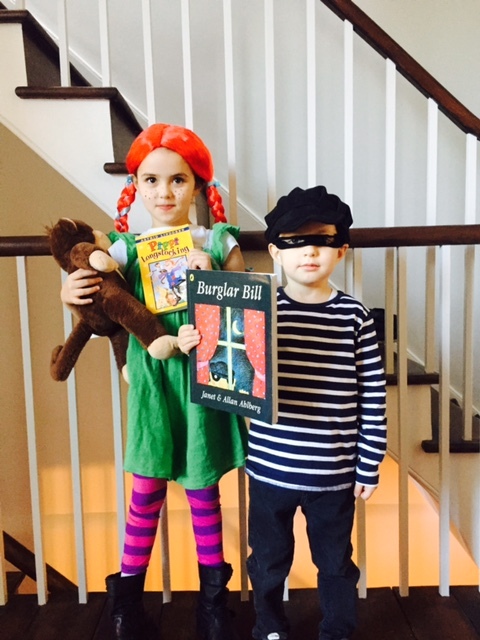 Thought you would like this picture of children dressed up as Pippi Longstocking and Burgler Bill! Many of our learners have grown up with access to all sorts of search engines, namely Google which has quickly turned from a noun to a verb: “Just Google it.” With access to Google, many of our learners have instant answers that are just a few clicks away. 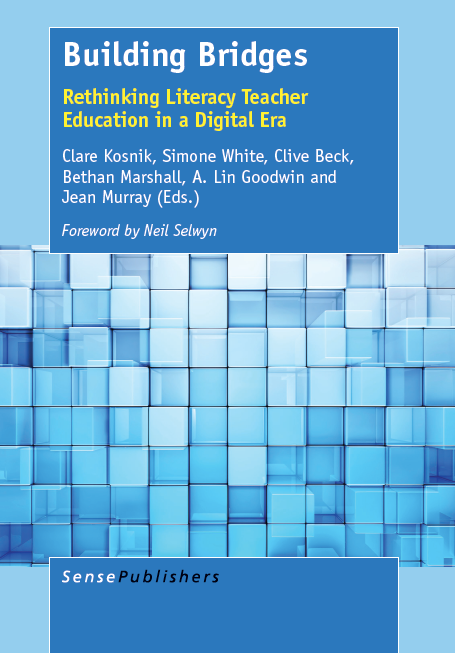 I envision project-based learning and inter-disciplinary approaches as a way into creating Google proof material. Any suggestions? What have you tried/created/heard about? Short or Long Form Writing? 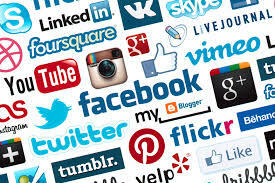 There is a lot of enthusiasm today about the potential of short form communication – tweets, blogs, etc. 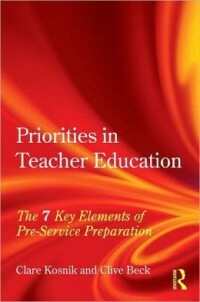 – to facilitate inquiry and professional development. At the same time, books and long articles continue to be published in huge numbers. Which medium is likely to have greater impact? An obvious response is that we should use both; but when forced to choose (either as reader or writer), which should we opt for? In my (Clive’s) view it depends on the context and how we go about it. 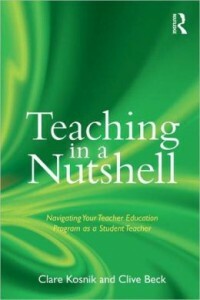 Teaching is such a complex process that individual tweets or blogs about it may be of little use. However, if they are part of an ongoing conversation (literal or metaphoric) they can be very valuable. It is the same with articles and books: they must respond to the concerns and thinking in the field if they are to be helpful. Wittgenstein once said (according to Iris Murdoch – NYT, January 24, 2016): “One conversation with a philosopher is as pointless as one piano lesson.” So much for short form communication! But it depends on the context. For a serious pianist, a single interaction with another pianist can have a big impact. And equally, if an academic is willing to dialogue rather than just lecture endlessly about their theory, one conversation can be very helpful. Whether short or long, communication should as far as possible “keep the conversation going” (to use Rorty’s phrase) so people learn from each other and there is a cumulative effect. We cannot always have an actual conversation, but if we listen to what others are asking and thinking we can make a contribution. A Book Printing Machine at Toronto Library! The CBC reported that this past weekend the Toronto Reference Library unveiled book printing machine which allows individuals to walk away with store-quality books. As of now, authors can print 10 copies of their books (150 pgs) for $145. A bit pricey in my opinion, but definitely unique with a lot of great potential for students, writers, educators, etc. CBC reports that “What’s new is the ability to self-publish books – whether your own piece of literature, a cook book, dissertation or whatever you choose for a relatively.” The Toronto Reference Library will soon be offering courses on how to best format books for professional looking books.